Borgarfjörður eystri (the fjord named Borgarfjörður in East Iceland) lies about 70 km by road from Egilsstaðir. The village is named Bakkagerði and the fjord's population is slightly under 150. The vicinity of Borgarfjörður is known for its great natural beauty, with many people considering it one of the country's prettiest areas. In Borgarfjörður, there are excellent facilities for bird-watching, for instance a special hide from which over twenty species have been sighted at once. At Hafnarhólmi by the harbour for small craft are among Iceland's best facilities for bird-watching, in particular to see puffins and kittiwakes. Many reindeer roam the area but are quite shy and hard to find. The environs of Borgarfjörður are accounted Iceland's second largest rhyolite area. 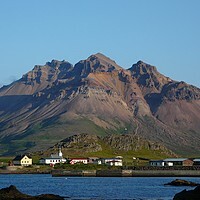 One extinct central volcano is located in Njarðvík and another at the landward end of Borgarfjörður; both have been carved apart by Ice-Age glaciers. Unique geological formations are frequent, and the area is famous for its attractive minerals; however, the taking of rocks is prohibited without special permission from the property owner. North of Borgarfjörður by the inlet of Njarðvík, it is easy to view the marvellous rhyolite of Innra-Hvannagil canyon, where numerous dark basalt dikes crisscross the bright slopes. It is the mountain colours and forms which visitors first notice upon arrival in the area. West of Borgarfjörður, most mountains are dark basalt, with Dyrfjöll ("the door mountains") highest and most splendid. East of the fjord, the mountains are much lighter, being mostly composed of rhyolite with dark basalt intrusions, although they change sharply in colours by weather, above all if wet, when their hues become significantly darker and more distinct. Until 1949, when a road was graded, all traffic through the scree between Njarðvík and Borgarfjörður was on foot or horseback. Whoever goes by should bend down and honour this sign of Christ. Travellers often pray here about their journey. Right by the village, the legally protected hill of Álfaborg, which the "fjord of Borg," Borgarfjörður, is named after, rises about 30 m high. Accessed by an easy trail and with an observation point on top, Álfaborg is home to the queen of Iceland's elves. In addition, Borgarfjörður has numerous stories of relations between its elfin and human residents. Many places are connected with elves and "hidden people," including the church of the elves Kirkjusteinn: a huge, appropriately shaped rock in Kækjudalur valley. Several stories tell of trolls in the mountains. Fishery: Some 10-12 boats fish from here, catching mostly cod, which is salted and sold to Spain, while the heads are dried and sold to Nigeria. Agriculture: Several farmers run sheep, since the region is well suited for grazing, and there are some horses. 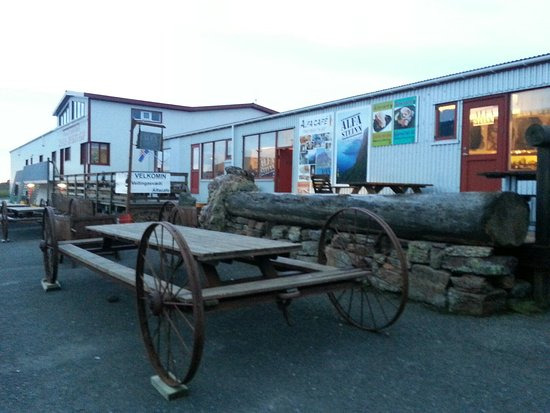 Industry - services: The stone-processing shop Álfasteinn produces artistic articles and souvenirs out of rocks from Borgarfjörður. All general services are available in the fjord, such as a school, pre-school, bank, store, post office, clinic etc. Iceland's most popular artist, Jóhannes S. Kjarval, grew up at Borgarfjörður. In 2002 the Kjarval Room was opened here to show his connections with the fjord and some aspects of this famous painter's life, who often showed elves in his works. One of the community's most precious treasures is the altarpiece in the church, which Kjarval painted in 1914. Processing area stones into handcrafts, the firm Álfasteinn has won international recognitions for its products and has a delightful exhibition of minerals found in the vicinity. Many coastal inlets lie between Borgarfjörður and Seyðisfjörður. While people lived in most of them past the middle of the 20th century, they are all deserted today. Now this area has become a "Paradise of the Hiker," with local people marking numerous trails (about 140 km) and publishing a quality map, besides building comfortable hiking lodges and WCs. As services for hikers have developed in recent years, the area has become one of the best organised walking regions in Iceland.